Toyota Prius, an innovative hybrid car, caught the attention of a number of people when it was first launched, especially those who want to be acknowledged as someone who promotes ‘green’ technology. As in the case of any new object, unforeseen hassles are bound to arise sooner or later and Toyota Prius batteries are no exception, though they are advertised as lifetime rechargeable batteries. As in case of any other car battery, the Toyota Prius hybrid battery ultimately drains out completely after some time and cannot be recharged, notwithstanding the advertisements about how it gets recharged while in motion. What happens when the battery fully gets discharged? This point has not been properly covered in any of the advertisements. This car is run by both petrol engine and electric motor that substitute according to the requirements. In other words, the Prius battery initially powers the motor in electric form and gets recharged when the car is run by the normal petrol engine. The car automatically changes over to petrol mode as soon as the battery gets exhausted and gets back to electric mode when the battery is recharged. Why Toyota Prius Batteries Fail? The reason for the reconstruction or restoration of Prius batteries is because the sealed nickel- metal hydride battery has only limited life, similar to an ordinary car battery that needs replacement occasionally. The problem is not the power of the battery, but its capacity to recharge; it means that a completely charged battery gets weaker with age. The fuel consumption begins to increase as the petrol is compelled to exert more pressure. While normal batteries ultimately become dead when it is frequently overcharged, the batteries lose their power as it cannot be charged adequately. Ultimately, these type batteries will also be dead and the user has only two choices, either buy a new or a reconditioned battery or reconstruct the existing battery. Prius replacement batteries cost anywhere between $2200 and $5000 depending upon the location of the user and the model and year of manufacture of Prius battery he is using. For a replacement battery the price is too exorbitant. However, it works out much cheaper, if he chooses to rebuild the existing battery. There are lots of websites that offer advice on this. However, these online instructions are too sketchy that it is somewhat difficult to understand and any attempt to rebuild the battery without proper understanding will end up in damaging the battery beyond repair and the only option would be to buy a costly new battery. There is also online commercial e-book in PDF format that gives detailed instructions on how to reconstruct 1st and 2nd generation Prius batteries. The most difficult part of reconstructing the Prius hybrid battery, making use of these instructions, is taking out the battery as it is very heavy. However, with the help of a couple people it can be taken out. Toyota Prius Hybrid Battery Rebuild guide is much more than a book of instructions; it explains with pictures of the author’s previous Prius battery rebuild, which makes it simple to understand and implement the instructions to reconstruct the battery. The guide also furnishes a list of reliable suppliers of parts required for reconstruction of the battery. The guide is well presented and easy to understand even for people who know nothing about hybrid batteries. You can save thousands of dollars and restore the Toyota Prius battery back to working condition by utilizing this guide. Another advantage of using this guide is that it helps in understanding on how to revive the fuel economy potential of the Prius battery. This is in addition to savings that accrues in avoiding the need to buy a new Prius battery. Additionally, there are tax rebates in the USA for running a hybrid car. You can claim a rebate as much as $2000 from the gross income. If you are confident, you can take up the reconstruction work at home or otherwise a friend or relative can help in rebuilding the battery. If these options do not work out properly, it is better to engage the services of a mechanic to do the job by a paying him for his services. He can be given a copy the battery rebuild guide for doing the job of rebuilding the battery properly. You can still save thousands of dollars by this method. The advantages of rebuilding the battery of Toyota Prius hybrid car is that the car can be put back in excellent running condition. Not only that, this e-book can also help people in getting additional income by collecting a number of Prius batteries lying in the scrap yard or buy them at throwaway price and reconstruct them, which can be sold for cash. Some sites or people are selling their rebuilt batteries for $1500 or even more. 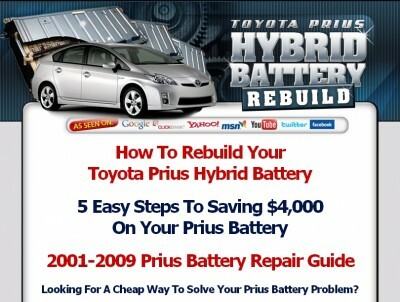 Click on the link below to get a copy of the Prius battery rebuild e-book right now. 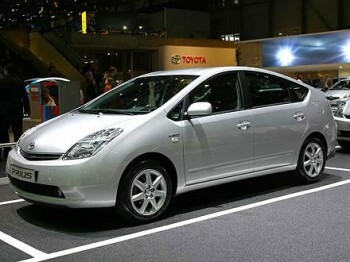 ==> Click here to get Prius battery guide!